A couple of nights ago I had really restless sleep. The reason is simple. 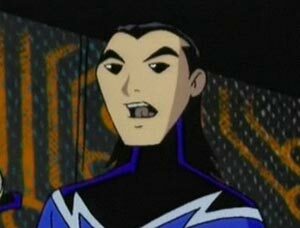 In my sleep I was guest-starring in an episode of one of my favorite current cartoons, "Teen Titans." When I say guest star, I don't mean that I was in the episode as one of the main characters, or even one of the recurring characters. I was in the episode as me—Christopher Grant Harris. And animated version of me, about ten years younger than I am now (I didn't have a beard, but I did have long dark hair). I proceeded to dream an entire episode of the cartoon, from beginning to end, with places for commercial breaks and everything. I even dreamed the goddam Introduction, for chrissake! Being that the experience was unusually intense, upon waking I concentrated diligently on remembering exactly how the dream went. Allowing for variances, I think I probably remember at least 80% of it accurately (some parts moreso than others). But I know how my memory works. No matter how vivid the dream, it would eventually fade. So I took it upon myself to write out the episode as I remembered it happening. So here is that endeavor: a complete episode of Teen Titans, as I remember dreaming it, with a little bit of extra glue to hold some parts together. But it is surprisingly accurate to how I dreamt it; I have to give much kudos to my dream people for being able to put together such a coherent narrative. I'd say that this script is about 80% accurate to my memory of the dream, which was 80% accurate to the actual dream. What's 80% of 80%? Hold on. So there. This script is about 64% accurate to the dream I actually had. In most cases that would be a D grade, but I think in this case it's pretty goddam good. The episode is surprisingly dark, and was a rather draining experience to dream. I trust that it will be much more enjoyable to read. It has fun stuff like me getting the s--t beat out of me and crying like a baby for much of the running time. Really, I do not come out very well in this story. The tower is dark. Waves lap the shore of the Tower’s island. A shadowy, indistinct form appears among the waves and drifts towards the shore. The room is dark. Most screens are blank, although some indicate that the tower security system is online and active. Suddenly a screen lights up with an overhead contour map of the island. A blip appears along the shoreline. The alarm suddenly blares, startling Raven. A wave of black energy reflexively lashes out from her, knocking over the candles and catching a wall tapestry on fire. Her eyes are glowing with fury. Suddenly she shakes her head and her eyes clear, and she looks in horror at what she’s done. 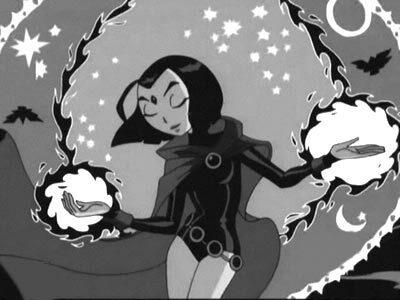 She reaches out a hand and smothers the flames with a shield of black energy, then fearfully looks at her own hands. She suddenly realizes that the alarm is blaring and looks up to a computer screen, which shows the overhead view of the island with the blip along the shoreline. An overhead view of the Tower Island that matches the topographical computer readout. There is something on the shore, but it is much too dark to make out any details. It is moving slowly and rhythmically, as if breathing. As the front door bursts open and Robin, Cyborg, and Beast Boy in tiger form come rushing out of it. The shadowy form can just be seen behind some rocks on the shore. Robin, Cyborg, and tiger-BB skid to a halt some distance from it. Starfire comes swooping down from above and joins them. Whoever you are, show yourself! The form behind the rock doesn’t advance or say anything, just continues breathing. We can HEAR now it’s shallow, ragged breath. Raven floats down and joins the team. Robin motions for everyone to move in. They all cautiously approach on foot in a closing semi-circle, except for Starfire, who hovers above with glowing hands and eyes. Suddenly the form on the shore bursts upright and stumbles forward. It’s a young man with long dark hair. He is shirtless and shoeless, and his pants are torn to shreds. Three horrible claw marks go from his left shoulder, down his chest, and his right arm hangs uselessly at his side. He lurches forward towards Raven, who reflexively takes a step back. The injured man falls forward and reaches his good left arm out towards Raven. The Injured Man is unconscious in a bed, hooked up to many medical devices. The Titans stand around him. Ooh… I do hope our injured intruder will recover soon. I am very curious about many aspects of his intrusion. Yeah, like who is he? And why did he wash up on our island? And what caused his injuries? Robin is at a computer terminal. I can answer Beast Boy’s question. I ran a DNA check. His name is Christopher Grant Harris. He lives in the city. Straight-A student, no criminal record, not so much as a speeding ticket. Welcome, Christopher Grant Harris. I hope your intrusion is a pleasant one. He can’t hear you. He’s unconscious. Cyborg looks over some medical readouts. And no wonder. The guy’s been seriously beat up. I think Raven’s question is the most important here. What did cause his injuries? B.B., what about those claw marks? BEAST BOY holds up his fingers and watches as they transform into various animal claws. They weren’t caused by any animal I know of. And, dude, I’m Beast Boy. Then we need him to talk. If the thing that caused his injuries is still running loose out there, we have to find it and stop it. Multiple lacerations, broken right arm, head trauma. Robin, I’m not sure that he’s even gonna be able to wake up from this. Raven, what about your healing powers? Raven takes several steps back and huddles under her cloak. I… I can’t. It’s too much. Please, Raven. You know I wouldn’t ask if we had any other way. But we have to stop this thing before it hurts someone else. Please. Raven looks around her. The rest of the Titans are looking at her expectantly. Robin puts a hand on her shoulder and smiles. Beast Boy and Cyborg are playing GameStation on the couch. Robin sits at a nearby table looking over Chris’s medical readouts. Starfire approaches him with a plate piled high with some steaming glop. Robin, you have been worrying yourself over this Christopher Grant Harris’s wounds now for an entire day. Perhaps if you partake of some of my dessert it will ease your mind? Starfire holds the plate under Robin’s nose. …to happen to anyone else. Chill, Robin. There’s nothing any of us can do unless Raven can get inside his head. Yeah, or until the guy wakes up. I know. It’s just that Raven’s been with him all day. Robin looks at the door. Raven sits next to Chris’s bed with a glowing hand on his chest. The huge gashes in his chest have shrunk now to pale scars. She has another glowing hand on the side of Chris’s face. Her eyes are closed in concentration. I’m a little worried about her. Everything is completely black. Raven stands small and alone in the blackness. Ugh, that sounds so lame, using his full name. She walks around, looking about her. Suddenly she sees the form of Chris as he was when they found him, shirtless and bloodied, huddled with his arms around his knees, rocking slowly back and forth. Chris looks up and stumbles blindly backwards. I’m a friend. I’m here to help you. Where am I? What’s going on? He looks up at Raven. Tears start streaming down his face. He reaches for her. The footage from Prologue where Chris reached out towards Raven in exactly the same way. Raven is uncomfortable with Chris’s emotions. She wraps her cloak around her. We need to know what attacked you. Chris takes a step towards her. Suddenly the blackness behind Raven is replaced for just a split second with a vision of a demonic-looking red creature that screams in horrifying anger. Just as suddenly there is nothing but blackness again. 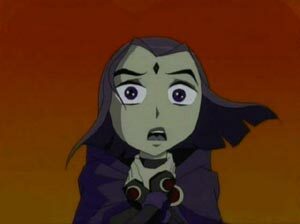 Raven is startled and turns around, her eyes glowing and her hands crackling with black energy. She looks quickly around but sees nothing. Suddenly one of Chris’s hands closes around Raven’s arm from behind. She gasps and whirls back around, a glowing fist poised to strike. Raven sees the look of abject terror in Chris’s face and her eyes and hands flicker back to normal. She is stunned immobile as Chris pulls himself towards her and buries his head in her shoulder, sobbing uncontrollably. As the sobbing continues, Raven is at a loss for what to do. For several seconds she simply does nothing as her face expresses fear and uncertainty. Then Chris’s right hand works its way up and rests tremblingly on Raven’s left cheek, accidentally brushing back Raven’s hood in the process. Raven is startled at first, but then places her own hand on top of his. She blushes. 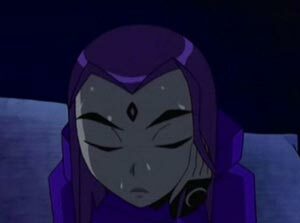 Raven closes her eyes, takes a deep breath, and gently wraps her arms around him. They slowly sink down to their knees together as the camera trucks back… and back… until they are just a speck in the blackness and then they are gone, and all we can hear are Chris’s sobs. A single tear works its way out of one of her eyes and traces down her cheek. Raven’s eyes pop open and look around. Raven is sitting on Chris’s bed. She cradles the unconscious young man in her lap. Raven notices the rather compromising position she is in with an unconscious man. She blushes and disentangles herself. She slides off the bed and takes a step forward but stumbles. Robin steadies her. You’ve been at this for twenty-four hours, Raven. You need to rest. Or you need to eat something. Raven glances back at the unconscious Chris, whose face now is twitching with a consternated look. I saw… something. But it was too quick to make out. I think it was what attacked him. I need… I need to go back to him. Robin takes a step back and looks at Raven. She looks exhausted. Are you sure you can handle it? Raven places a hand on Chris’s cheek. Chris stops twitching and a look of peace comes over him. Raven again is alone in the blackness. She pulls her hood back and calls out. Chris steps out of the darkness near her. He bounds towards her and embraces her tightly. Raven blushes at first, but then lets a small smile form on her face as she closes her eyes and wraps her arms around him in return. I’m sorry I had to leave. But I’m back now. She languishes in the embrace a moment longer and then clears her throat. What happened to me? What is this place? Raven steps back looks up into Chris’s eyes. You were attacked by something. We found you unconscious. I brought you inside my mind so you could tell us what hurt you. Your mind? How did you… who are you? My name is Raven. I’m a Teen Titan. You washed up on our island. You were injured. I’m working at healing your body, but we need to know what attacked you so that we can stop it from hurting anybody else. Suddenly the blackness around them flashes and the image of the monstrous red form appears before them and roars for a the briefest of moments before being replaced by the blackness. Chris buries his face in Raven’s shoulder. It’s gone. It’s all right. It can’t hurt us here. It’s not real; just a memory. But we need you to remember. I need you to remember. Raven holds Chris away an arm’s distance and looks into his eyes. Yes. You can. I’ll help you. Chris reaches out and places his right hand on her left cheek. Raven places her hand on his cheek. I… I won’t leave you. I promise. Robin is nervously pacing the floor, while Starfire plays Beast Boy at some GameStation game as Cyborg cheers her on. Yeah! Show that little green guy who’s the boss! Yes, Beast Boy! You are now my employee! The door to the rec room opens and in steps none other than Aqualad. They all rush up to him. 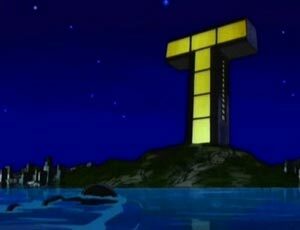 What brings you to our western version of Teen Titans? I was in the neighborhood; thought I’d stop by. Same old, same old. Saving the city from dastardly villains. You know. The Titans all nod in agreement. Taking care of our patient. Aqualad is looking over a photo of the gashes on Chris’s chest. Nope. Nothing underwater that I know of makes a mark like that. Just then the alarm starts blaring and red lights flashing. What is it? Somebody else wash up on shore? No. Dr. Light has broken into the museum. Time to save our city from a dastardly villain. No. She shouldn’t be disturbed right now. But that leaves us short one Titan. Looks like you can be some help after all. They all (including Aqualad) rush for the door. Raven and Chris stand facing each other in the blackness. Chris takes her hand and smiles as their fingers entwine. Raven finds herself blushing again. They turn and take a step forward into the blackness. Raven and Chris, hand-in-hand, step out of the blackness and into a bright light. It slowly resolves itself into a typical teenage bedroom, but distorted and disjointed due to memory. MEMORY CHRIS is sitting at the desk in the room scribbling something on some papers. Textbooks are scattered around, and it is evident that Memory Chris is studying. My bedroom. I was doing homework. They walk forward through the memory bedroom and pass a bookshelf. Raven happens to glance at it. Chris, have you taken out the trash yet? Memory Chris glances at his watch. I was just going to just now. Chris pulls Raven closer and holds her as he opens his eyes. The memory alley takes shape again, but darker and more distorted than before. Memory Chris looks up, and from above there dives a hideous, red, demon-like but strangely featureless creature with bat-like wings. As Memory Chris shouts out in fear, the creature swoops up and snatches him off the ground, knocking over the garbage can. The creature speeds off into the night sky. My god… then what happened? The scene around them begins wavering, only occasionally coalescing into a brief, terrifying moment: Memory Chris and the creature in flight; The creature throwing Memory Chris to the ground in an empty warehouse by the docks; The creature beating the tar out of Chris. A wooden door on the outside of the warehouse is shattered as Memory Chris’s body is thrown through it from within. Memory Chris bounces like a rag doll several yards down the foggy docks. Behind him the form of the creature is vaguely seen emerging from the warehouse and stalking towards Memory Chris. Memory Chris weakly stretches out his good left arm and pulls himself slowly forward… slowly… towards the edge of the dock, until just as the creature reaches out to grab him, Memory Chris goes tumbling over the edge of the dock and quietly slips into the turgid, dark waters below. The creature stands at the edge of the docks. Its horrifying and unnatural claws clench as it screams in frustration. And the current carried you out to Titans’ Tower. 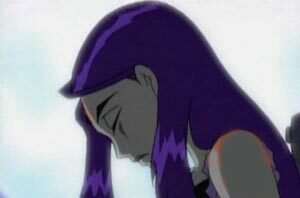 Raven glances over at Chris, and sees that he is sobbing silently. She gently pulls his head down to her chest and holds him. It’s okay. It’s over now. Raven is on the bed, holding Chris exactly like she was in her mind. His eyes flutter and then open. He raises his head and looks around. Yeah… yeah, I guess I am. Now I can give a description of that monster to the other Titans. Shouldn’t be too much trouble to track down something that looked like that. What do you… what do you remember? Chris holds his head and shuts his eyes tightly, as if trying to squeeze away the memories. Then he opens them and sees Raven’s look of concern. And I remember you. You were there with me. Raven. He reaches out his good left hand and touches her cheek. You promised you wouldn’t leave me. And you didn’t. You stayed with me. He slowly brings his face close to hers. 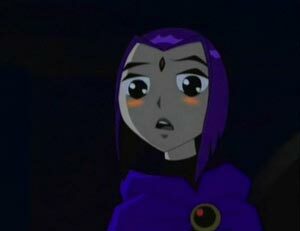 Raven closes her eyes as their lips approach for a kiss. Where Chris and Raven are just millimeters away from a kiss, when suddenly an unnatural scream of rage is heard. Chris jerks away and sits bolt upright. He looks at Raven in absolute terror. A terrified Chris sits on the bed with Raven. A blood curdling scream of rage is heard from outside the tower. Raven gets up and rushes to the window to look out. CRASH! In a blur, a clawed arm smashes through the window and swipes at Raven, tearing strips off of her costume. She jerks backwards enough so that it doesn't get any skin, but her heel catches in the floor and she falls to a sitting position. A bolt of dark energy reflexively shoots out from her and knocks a nearby piece of medical monitoring equipment over so that it falls across one of her legs. She cries out in pain. The red monster pulls itself in through the shattered window and we see it clearly for the first time. It is a robot. A red, demonic-looking robot about nine feet tall, with metal bat-like wings. Its head turns and stares directly at Chris. Raven glances quickly at Chris and sees that he is frozen, immobile with fear. She looks around her and sees the broken glass from the window. She reaches out a black glowing hand and the shards are enveloped with her dark energy. They hover off the ground a few inches and then fly lightning fast towards the robot. It raises a hand to shield its face and the shards embed themselves harmlessly in its arm. It begins to advance across the room towards them. Suddenly all around Raven flash the images from Chris's memory of the demonic creature beating and slashing him. 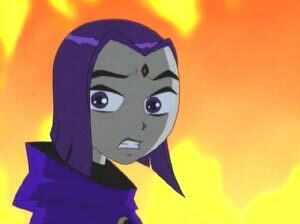 Raven's voice catches in her throat and a terrified look comes over her face. She is immobilized with terror. The robot advances across the room and walks right past her, towards the cowering Chris. 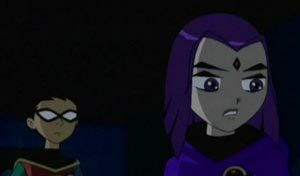 Raven glances at Chris and her eyes become suddenly dark. We hold on the corridor for just a moment, and then a section of one of the walls is blown inward by a blast of dark energy, and Raven comes limping out through the opening, towing Chris by his arm. The robot bursts through the opening behind them, sending rubble flying. It looks both ways down the corridor. The corridor is empty in both directions. At the robot as it looks around. We pan over a little bit and see Chris and Raven slip into a doorway that slides silently shut behind them. Chris and Raven huddle in the dark closet, breathing hard. The flashes of horrifying memories of being beaten by the red demon creature appear all around her. I was terrified. Of it. When I brought you into my mind I must have taken something, the fear you experienced when you were captured by that thing. I... I'm scared. But you promised you wouldn't leave me once. Now I promise I won't leave you. Okay? Raven looks into his eyes and sees the abject terror in them, but also something else, a certain confidence. She smiles. Okay. Where are the other Titans? The evening wind blows in through the shattered window, and disturbs some shreds of Raven's costume, revealing her communicator lying on the floor. We have to get help. I can't control my powers if I can't control my emotions, and I can't control my emotions with your terror stuck in my head. The robot's clawed arm bursts through the wall behind them. The door slides open and Chris and Raven run out, screaming for their lives. The robot bursts through the opening moments later. The Titans with Aqualad are pinned down behind some rubble as Dr. Light floats on the far end of the room near some dinosaur bones that have been shattered into rubble. He is constantly firing lasers at their positions, rendering them basically unable to fight back. Not another guy washed up on shore, is it? Raven, this is Robin. Do you read me? Robin's voice comes out of the communicator lying on the floor. Raven! Do you read me!? I can't raise Raven. We have to get back there. Cyborg! Beast Boy! Cyborg grabs Beast Boy and hurles him at the door to the outside. Beast Boy transforms in midair into first a swordfish to be more aerodynamic, and then as he approaches the door he transforms into a hippo. But just as he is about to smash through the doors, a yellow force field appears in front of them. Beast Boy the hippo smacks into the force field and transforms back to human mode. He sits up and rubs his head. Ah, ah, ah! None of you are going anywhere... ever again! The door slides open and Raven and Chris run in, breathing hard, absolutely terrified out of their minds. Raven, dragging Chris, limps over to a console and pushes buttons on it. Robin! Robin, where are you!? Robin throws an explosive disc at Dr. Light, who easily deflects it with a yellow force blast. Raven's voice comes from the communicator in Robin's hand. Raven! What's going on back there? There is the sound of an explosion and then the communicator goes dead. Chris and Raven are prone on the floor amidst electronic debris. The robot has its entire arm up to its elbow embedded in the console that Raven had been using, which is now bellowing smoke and fire. The robot pulls its arm out of the console and turns to the two on the floor. It brings its arm back as if to punch them. She throws her hands up in front of her face, and reflexively a bubble of dark energy forms around her and Chris. The robot swings at it. The evening sky has clouded over. In conjunction with a lightning bolt, the rec room window shatters and the bubble of dark energy comes flying out. It falls the entire distance down to the island below. The dark bubble lies among some rocks. Inside, Raven is looking over Chris, who is holding his slinged arm. Chris! Are you all right!? Suddenly the robot leaps down next to the bubble and picks it up in its arms. Raven and Chris scream in surprise and terror. Stupid girl! You think you can protect him? You have no idea who he is, what he can do! His powers will eventually destroy you! Luckily for you, I'll kill you quickly so you won't have to suffer. The robot begins to squeeze the bubble of dark energy as lightning flashes through the clouds. Its mechanical joints creak at the strain, but the bubble slowly begins to contract. Raven and Chris cling to each other and look about them with absolute panic as the bubble threatens to crush them both. Suddenly Cyborg's sonic blast pierces the night sky and smashes into the robot's head. It stumbles backwards and drops the bubble, which instantly disappears. Raven and Chris go tumbling like rag dolls down a slope towards the water. Beast Boy as a pteranadon is carrying Cyborg. Starfire is flying, carrying Robin. Aqualad is body surfing a wave towards them. Lightning crackles behind them. Nice shot. Now let's take this tin can down. Titans, go! Starfire throws Robin at the robot. Robin extends his foot and kicks the robot in the chest. The robot stumbles backwards some more as robin rebounds up and over its head, just in time for Starfire's starbolts to impact all over the robot's surface. Raven and Chris lay prone, just a few feet from the shoreline. It begins to rain. Raven raises her head up. The Titans are fighting the robot up at the top of the slope. The camera pans a little to the side and we see Chris's prone body. He is not moving. Raven crawls over to him and gently puts a hand on his cheek. His eyes flutter open. I promised I wouldn't leave you, right? The Titans have the robot pretty much worn down. One of its arms hangs loosely, attached by only a cable or two. They surround it in a semicircle. Simultaneously Robin throws a handful of explosive discs at it, Cyborg fires his sonic blaster at it, Starfire fires her eyebeams at it, and Aqualad shoots a jet of water from the ocean at it. An explosion appears next to Titans Tower. Raven covers Chris as robot debris rains down around them. Robin steps into view. Raven looks up at Robin, smiles weakly, and then both she and Chris promptly pass out from fatigue. Raven is alone in the blackness, but the blackness quickly fills with horrifying images of the red creature attacking her. Raven sits up in bed with a scream. It was a nightmare. She is sweating buckets and she holds her hand to her heart, which is racing. She looks around and realizes where she is. Chris is in a bed next to hers. Robin sits next to her bed. He smiles. What... where were you all? We had a run-in with Dr. Light. We sent him back to jail, though, and just in time it would seem. Was that robot...? He'll be fine. Just some bumps and bruises, but he's mostly exhausted. You both are. Raven looks over at Chris and breathes a sigh of relief. The door bursts open and Cyborg and Aqualad burst in. Got it! The parts that made up that robot were all ordered at the same time, and all delivered to the same address. A warehouse on the docks. She's right. That's kinda scary. Raven throws back the covers and stands up. Her eyes are full of blind fury. What are we waiting for!? Let's go down there and make whoever built that robot pay. Dark energy begins to crackle around her, and waves begin to lash around the room, knocking over equipment and generally causing havoc. Cyborg leaps out of the way of a lash of dark energy. Raven looks at Robin and backs down some. The dark energy dissipates. She holds herself steady against the wall to keep from collapsing. You're in no condition, physically or mentally, to help us on this one. HE needs you here. He's still your patient. Don't worry, Raven, I'll keep these guys in line. That's not what I'm worried about. Robin takes Raven by the shoulders and gently eases her back into the bed. Don't worry. Whoever made that robot is going to pay. I'll make sure of that. Let's go, Titans. Raven is back asleep before they're even out of the room. The side door (which has been crudely repaired from when the robot threw Chris through it) bursts open and the Titans flood into the building, weapons/beams/claws at the ready. They look around. He walks over to a spot on the floor where there are claw marks in the solid concrete floor. But this is definitely the right place. Robin notices that there are stairs along one wall that lead up to a small office. Once again with weapons at the ready. But they glance around and slowly stand up, awestruck by what they see. Dude... that is just wrong. The walls of the office are entirely covered with photographs, drawings, and other likenesses of none other than Chris. A workbench along one wall is covered with robot schematics. Along the other wall is a disheveled bed, on which sits a disheveled young woman. She is sobbing into a teddy bear that has a photo of Chris's face taped over its real face. The young woman raises her face. Tears have streaked her makeup way far from being anything close to attractive. It failed! That stupid piece of junk failed! Villains do not usually cry until after we fight them, yes? Yeah, I'm a little weirded out here. Why did you build that robot? Why did you want to hurt Chris? Revenge! Why else! I sat behind Chris in 4th period for eight months, and he never asked me out! I loved him so much, and he never said more than four words to me! Um... did you tell him how you felt? I didn't have to! He could feel the way I felt! I know he could! We're soul mates, and soul mates don't have to tell each other how they feel--they just know! But he... he wouldn't acknowledge what we had together. He'd just smile at me and say, "Hi," like he didn't even know that we were destined to spend the rest of forever together! He was so cruel! I am confused. I did not know that human's could read each other's feelings. Do they all have a form of mental telepathy like you with fish? Aqualad opens his mouth to say something, but Robin cuts him off. They don't have mental telepathy, Star. But sometimes they do have mental problems. The Titans all look on as the woman continues to sob into the teddy bear. After a few moments, Raven appears, alone in the blackness, but the blackness again quickly fills with horrifying images of the red creature/robot attacking her. Raven sits up in bed with a scream. It was a nightmare again. She looks next to her. The bed where Chris was last night is now empty. The sound of laughing and splashing drifts up through the still-broken window. Raven gets out of bed and walks over to the window and looks down. Beast Boy and Aqualad splash merrily in the ocean with Starfire, Beast Boy turning into various sea creatures. Robin and Chris sit on a rock on the shore, dangling their feet in the water. They're both wearing swimming trunks and nothing else, except that Chris's right arm is in a snug sling. Cyborg comes running up to them. Look at you two and your cute li'l swimmin' shorts. The great Cyborg needs not such silly devices! Isn't that because, technically, you always walk around naked? Yeah, that's kinda creepy when you think about it. I'll show you creepy! Yaargh! He leaps at Beast Boy, who shrieks and turns into a flying fish, jumping out of the way as Cyborg makes an enormous splash into the ocean. Starfire giggles with delight. Beast boy pops back into human form. That's not creepy. This is creepy! Beast Boy reaches behind his back and pulls out the teddy bear with Chris's face. Cyborg shrieks in horror. I can't believe you kept that thing! Keep it away! Beast Boy chases Cyborg around the shallow water as Aqualad and Starfire laugh. On the rock, Robin and Chris hold up their arms to shield themselves from the splashing, basically to no avail as they both get drenched. They laugh. So that robot really said that you had some sort of power? Yeah. But I swear, I'm just a regular guy. I don't have any powers, not that I know of. None that would "eventually destroy" anybody. Chris is suddenly drenched in another huge splash. Ack! And I know for sure that I don't have the power to breathe underwater! But you did have power... in a way. Just look at the way that poor girl was obsessed with you. She gave you all that power over her. And it eventually did destroy her. Suddenly the screen flashes with images of the red creature/robot delivering all sorts of punishment to Chris. That's power that I never asked for. Are you still getting flashes? It isn't getting any better. I don't know if it ever will. I didn't know it was possible to live through so much terror. The door opens and Raven comes out. She stretches some in the warm sun and takes her cloak off, draping it over one arm. She notices that the midriff of her costume is still torn all to shreds, but shrugs it off. She smiles and looks out at the sea, watching the other Titan's play. She looks for a particularly long time at Chris and Robin, who are laughing and kicking water at the others. The screen suddenly flashes with images of the robot/creature punishing Raven. Raven, shocked, stumbles. She shakes her head to clear it and starts down the trail to the water. As she nears the others their voices drift up towards her. So now that she's in custody, what are your plans? I don't know. My parents are probably worried sick about me, and all my friends. I just need to go home and try to forget that any of this ever happened. The words are like a knife to Raven's heart. She clutches at her chest with her hand. Her cloak slips from her arm and falls to the ground. Tears well up in her eyes. The whole past couple of days have just been a big nightmare that I need to wake up from. Robin nods in understanding. Behind them, but unseen by them, we see Raven turn and run in tears back into the tower. But Raven absorbed some of my fear. I hope she can forget it as well. Raven kinda specializes in controlling her emotions. She'll be fine in a few days. Raven. There is one thing about these last couple days that I definitely never want to forget. Behind them the tower door slams shut loudly. Robin and Chris both turn and look at it. Chris notices something on the trail and runs up to it. It's Raven's cloak. He bends and carefully picks it up, then looks up at Titan's Tower. The door slides open and Raven rushes in, and leans against the door as it slides shut behind her. She covers her face with a hand as tears begin to flow from her eyes. Get a grip! What are you doing, crying like this!? Do you think you're in love with him or something? Did you think that he might possibly be in love with you!? You can't let your emotions get out of hand! She works on steadying her breathing. It doesn't work very well. There is a soft knock on the door behind her. Raven? Can I come in? Raven doesn't answer. She looks around her in near panic for a moment, before anger clouds her face. I was bringing it back to you. After a pause the door slides open slightly. Raven's face appears in the crack. She reaches out and snatches the cloak from Chris's hands. The door starts to slide shut again, but Chris jams his foot in the crack. You didn't want to leave without saying goodbye? Goodbye. There. No, that's not what... can I come in? Your door is kinda crushing my foot. Chris takes a few limping steps then stoops down and rubs his foot as Raven wraps her cloak around her and pulls the hood down over her head. Yeouch! Listen, Raven, there was something I wanted to say to you. I wanted to say thank you for everything you did for me. But somehow that doesn't say nearly enough. These last couple of days have been the most terrifying time of my life. What I went through... nobody should have to go through that. Well, it's over now, so you can leave and just forget all about it. Forget everything. All I know is that when that thing was after us, we were both so scared that we couldn't think straight. But even then, when it came down to it, you didn't leave me. I promised I wouldn't leave you. Chris reaches out and raises her chin. Her hood slips back down to her shoulders. He looks into her eyes, and puts his hand on her cheek, wiping away a tear that flows from her eye. And I promise. I won't leave you. He brings his face down close to hers and slowly, gently, kisses her on the lips. She is not sure how to react at first, but then closes her eyes and kisses back. They enfold their arms about each other and the kiss becomes more passionate, then more, and more, until it borders on wild abandon. Suddenly a wave of dark energy lashes out from Raven and knocks over a lamp and tears up a hanging tapestry. Shocked, Raven breaks away from Chris and pushes him backwards. PROLOGUE: When she was meditating and was startled by the alarm, and she knocked over the candles, catching a tapestry on fire. ACT II: When the robot burst through the window and startled her, and she fell and knocked over that medical monitoring thing onto her leg. ACT III: When she is raring to go to the warehouse for revenge, and the dark energy lashes out at Cyborg. Raven covers her mouth with her hand and backs away from Chris. Raven bursts into tears and throws herself into Chris's arms. She reaches up and places a hand on his cheek. His face freezes and his eyes glaze over. I can't be with you. It's too dangerous for both of us. But I can at least do this for you. Dark energy flows from her hand into his head as dark energy raven's wings envelop them both. The wings rapidly tighten around their embracing bodies, obscuring them entirely. Then like clouds they dissipate, leaving only an empty room in their wake. This is definitely the alley behind Chris's house, as seen in his memories but without the distortion. The swirling dark energy raven wings appear, and when they dissipate they leave Raven and Chris standing there together. His eyes are closed--he is asleep. She gently lowers him to a sitting position against the wall of his house and kneels next to him. She places an object in his hand and curls his fingers around it. She leans forward and gently kisses his lips. Chris's eyes flutter open, but all that is left is a rapidly dissipating cloud of dark energy and the sound of a raven's anguished cry. He doesn't even notice. He looks around him, confused. The backdoor of the house opens and Chris's Mom steps out. Chris! My boy! Oh, my baby boy! She scoops him up as if he weighed absolutely nothing and squeezes him hard as tears stream down her cheeks. Oh, my baby! We were so worried! What happened to you? Where have you been for the past three days? Chris holds his crying mother an arms length away from him and a look of complete confusion comes over his face. Three days? I... I can't remember. I can't remember anything about them at all. Three days? Chris's Mom notices that he has an arm in a sling and scars across his chest, and has generally been beat up. Oh, my baby! Come inside, come inside, and let me take care of you. It doesn't matter what happened to you; you're home now. As she is leading him inside, he looks down at his hand. As he unclenches his fingers we can see that he is holding a small figurine of a Raven with its wings outstretched. Chris looks up to the sky as his mom ushers him inside the house. The Titans are all gathered, toweling off from their dip in the ocean (except for Aqualad, who likes being wet). Beast Boy is chasing after Cyborg with the Chris teddy bear. I told you to keep that thing away from me! Starfire reaches out and plucks it out of Beast Boy's hands. Yes, it is a very poor likeness of the intruder Christopher Grant Harris. He was not at all like a bear with a two-dimensional face taped to its head. She places it on a chair beside her and giggles at it. The front doors open and Raven slowly walks in. Speaking of Chris, where is he? I'd better get home as well. Who knows what kind of damage Mas and Menos have done in my absence? They all (except Raven) take turns shaking his hand. Thanks for the help with Dr. Light. My pleasure. See ya, B.B., Star, Raven... Raven? They all look around Raven is nowhere to be seen. Does she do this a lot? The door slides open and Raven enters. As she crosses the room to her bed she reaches into her cloak and pulls out the Chris teddy bear. She climbs onto the bed and cradles it in her arms as she quietly weeps. There you have it. I warned you that it was dark, didn't I? Hoo-boy, that is one sad, sad ending. I dreamed this dream just after watching the episode entitled "Birthmark," which is all about Raven being confronted with her horrible destiny to destroy the whole world. That's probably where all that stuff about her not being able to lose control comes from. And don't ask me about any of the symbolism in the dream, please. I couldn't care less what it "meant" to me personally. I cannot be held responsible for the contents of my dreams. But, man, Raven is a f--king incredible kisser.